Grace Lutheran Church was organized on February 2, 1888, with 18 charter members. It was notable for being the first “English” church, with services in English rather than Swedish, in the Augustana Synod. Connections to Augustana College were strong, and services were held at Augustana’s chapel in the early years of the church. On Augusta 27, 1891, the cornerstone was laid for the church shown on our this photo postcard from the Augustana College Library Special Collections. It held historical documents, newspapers, and coins, as well as drawings of the new building, which was designed by Philadelphia architect Benjamin D. Price. George Stauduhar, a prominent local architect, supervised the construction, which was done by P. Peterson of Moline. 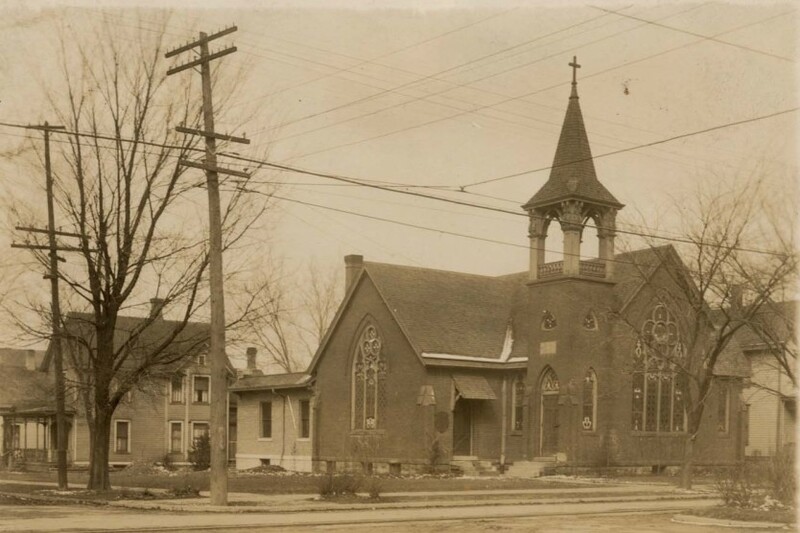 On February 21, 1892, Grace Lutheran church was dedicated. The cost of $6,000 did not include the site on the northeast corner of Rock Island’s 7th Avenue and 44th Street. With a 32 x 50 foot main sanctuary and an adjacent 16 x 24 foot lecture room, the new church was spacious enough for its suddenly shrunken membership. Grace’s congregation had recently divided, not by theological differences but by language. Those who wanted services in Swedish rather than English formed a new congregation, Zion Swedish Evangelical Lutheran Church, and built their church one block east of Grace. In 1901, a young newcomer to Rock Island, John Hauberg, felt fortunate to obtain a job teaching Sunday school at Grace. He continued in that position for a decade and later recalled that as many as 60 students were enrolled in one primary class. Hauberg went on to marry lumber heiress Susanne Denkmann, who donated $2000 to build a large Sunday School addition, which still stands. By 1928, Swedish immigrants were well assimilated into American culture and the language difference was moot. The two congregations reunited and moved to the larger Zion church, where the name was changed to St. John’s. For several years, the old Grace church was used as a parish house by St. John’s. In the mid 1930s, old Grace became the Farmall Club, a private club – a tavern, actually — for workers at the nearby International Harvester Farmall Works. Newspaper items over the years note a burglary resulting in lost cash, liquor and cigarettes and, in 1950, a police raid netted three slot machines and an arrested bartender. The postcard shows the church around 1920. A delicate open belfry capped by a slim “bellcast” or flared-roof steeple rises above the roof. Huge stained glass windows that nearly fill two walls dominate the otherwise modestly sized church. Sue Denkmann’s one-story Sunday School addition can be seen behind the church to the left of the postcard. Sadly, the entire steeple and the Gothic-shaped stained glass windows have been removed, probably during the Farmall Club tenure, to make the former church appear more secular. Even the smaller windows have had their pointed arches removed, although the outlines of originals are still visible. In the 1950s, the Pythian Club and subsidiary organizations moved into the building and remained here for a decade or more. Finally, in the 1980s, after periods of vacancy and some short term uses, old Grace came full circle. Once again it served a religious community, as the home of the Hispanic United Methodist Church. That denomination was particularly fitting because Grace’s architect, Benjamin Price, had originally compiled his church plans under the auspices of the Methodist Episcopal Board of Church Extension. Both that board and Price had sold his plans. Since this article was published, other congregations have moved into (and out of) the former Grace Lutheran Church. This article, by Diane Oestreich, is slightly modified from the original, which appeared in the Rock Island Argus and Moline Dispatch on November 8, 2004.